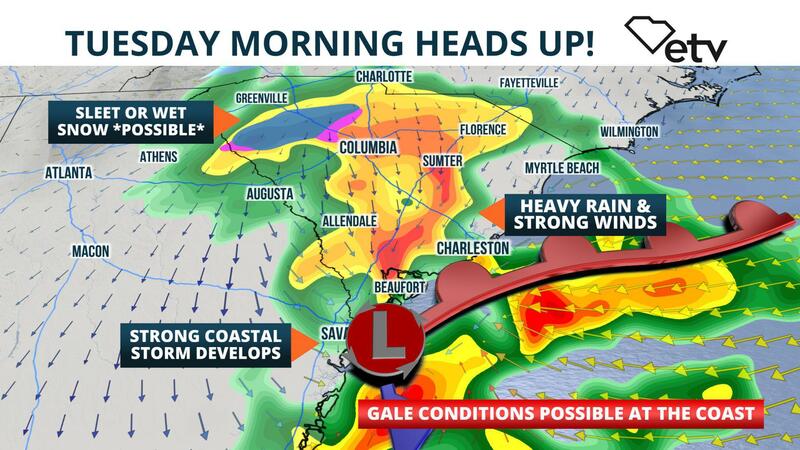 A coastal storm is forecast to form late tonight near the Northeast Florida coast and intensify as it hugs the South Carolina coast Tuesday morning. The impacts from the storm will be felt across most of the state, ranging from heavy rain and gusty winds over the Midlands, Low Country, and Pee Dee regions to the chance of snow or sleet mixing in with the rain over parts of the Upstate. National Weather Service meteorologists from the Charleston office say strong northeast winds may cause minor coastal flooding in normally flood-prone areas, such as downtown Charleston around daybreak Tuesday. The forecast of 1 to 2 inches of rain in the Beaufort, Sumter, Charleston, and Myrtle Beach areas may cause localized flooding of low-lying, urban areas. Small Craft Advisories and Gale Watches are in effect along the coast. Gusty winds from the storm could make conditions dangerous for mariners. Winds could frequently gust over 40 mph near the coast as storm intensifies. Enough cold air may allow for a period of wet snow to mix in, mostly over portions of Oconee, Pickens, Greenville, Spartanburg, and Cherokee counties. The highest elevations northwest of I-85 may see a light dusting off snow according to the National Weather Service in Greenville, SC. A few locations south and east of the interstate may see a wet snowflakes for a brief time, too, but no accumulation is forecast there. Rapidly clearing skies are expected over much of the state Tuesday afternoon as the storm moves away from the state.